I love your simple, primitive hearts! The Ladybug Tree is so cool.....never seen or heard of one before. Your twig hearts are perfect! Love them... and I a-door that chippy white door. Aren't winter walks great? So much beauty really. Is that called a Ladybug tree because it's kinda shaped like one, or because they hibernate in it? That photo is lovely. Your hearts are so pretty! I love those red branches. I too am curious about the ladybug tree. Do tell...:) The snow is so gorgeous. Have a lovely Wednesday. I love your hearts and yes they are really pretty! They have such a country feel. Thanks for sharing at Stephanie's party. Hi Karen, I LOVE your hearts created with the red branches. Such a wonderful heart wreath and adding the red ribbon bows is perfect. The ladybug tree is very interesting. I would love to know more. 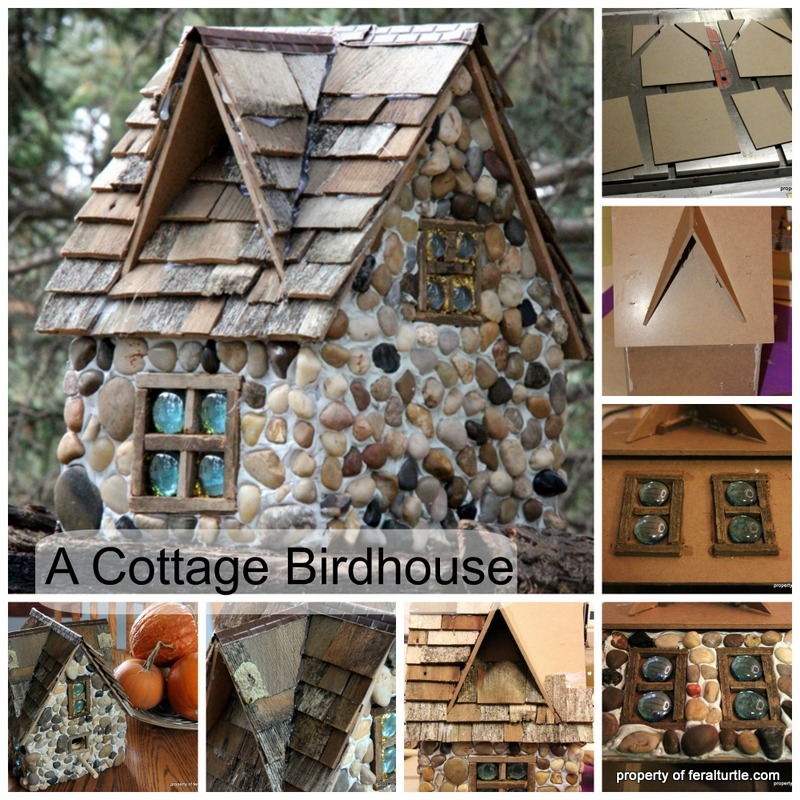 Thanks for sharing this pretty project. I would love to create these if I can find the branches. I wish I lived near some wooded areas. We have a lot of trees here, but nothing with cool branches I can cart home. 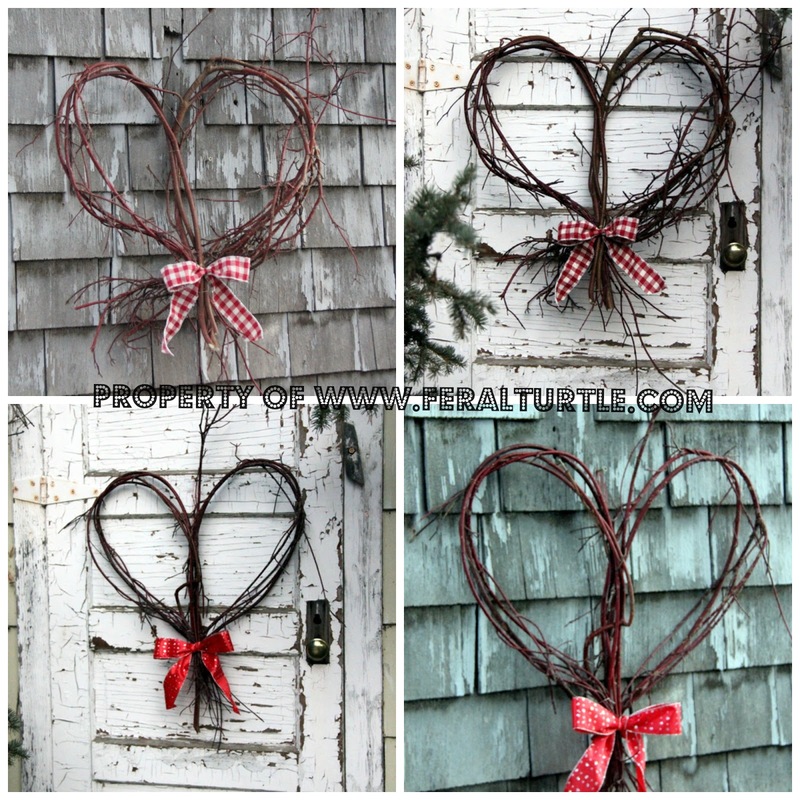 Your hearts are beautiful, and I am totally digging that rustic, white door! Those are just adorable hearts, Karen! Hadn't thought of the conspiracy theory, but you may very well be right! I personally think Valentine's Day has gained so much in popularity over the years, because there are so many people unable to let Christmas go entirely. The red, white & pink just seem to keep the festive-feel going for a bit longer. Plus, so many of us just don't know how to decorate for the in-between of Christmas and Spring! Karen your wreaths are just gorgeous! Is that Red Ochre Dogwood? We used to clip it in Montana for round wreaths. I wish I had thought to make a heart shaped one like yours. So pretty! I also wish we would get some snow for a lovely winters walk! So beautiful!!! What pretty hearts! And THAT chippy door! LOVE it! Your pictures are always so pretty Karen! I am inspired! See? Now there's proof of your creative brain always in action. I admire your willingness to take winter walks. Mine consist of house-to-car / car-to-house / repeat. Hello my friend. I love your fun hearts. Twigs can be a girls best friend. The chippy door should be mine and I love how you have displayed your woodsy love. Thanks for sharing. 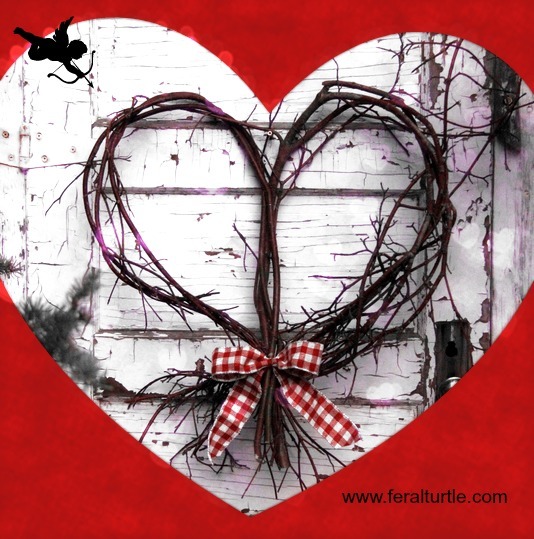 Your hearts are very inventive and the rustic branches look so chic with a ribbon! I really love your red door with the white paint around the glass panes! Your hearts are fabulous, my friend! The branches look so charming and the ribbon sets it off perfectly. Thanks for sharing at Roses of Inspiration. Hugs to you! These are so pretty! I want a red bush....that sounds terrible...but I love this, all vulgarity aside. :) I definitely think the candy people just take back their Christmas candy that didn't sell and re-purpose it for Valentine's. Miss you, lady. Winter never came over here, we've had one snow storm and gorgeousness ever since. I can handle winter if it's winter like this. What a lovely post. Thank you for showing us how you made these. It seems so simple, and yet without seeing it I would never have had this idea. I love decor that brings nature into the home and your wreaths are absolutely wonderful :) I am your newest follower. Please come visit and I would love to have you follow me back. I enjoy making new blogging friends and sharing ideas. Oh I LOVE these Karen ! Wonder if I could walk around with pruning scissors and cut some of my neighbor's bushes? After all you've done, keep them up. Put little plastic eggs on them for Easter, red, white and blue ribbons for July 4th, then poinsettias for Christmas. Wow, those are super cute and simple. Definitely keeping that in my pinterest file! Simple, rustic and pretty! Oh, and versatile too! Love the white door, and the red one is pretty as well! Hi Karen LoVE these hearts! 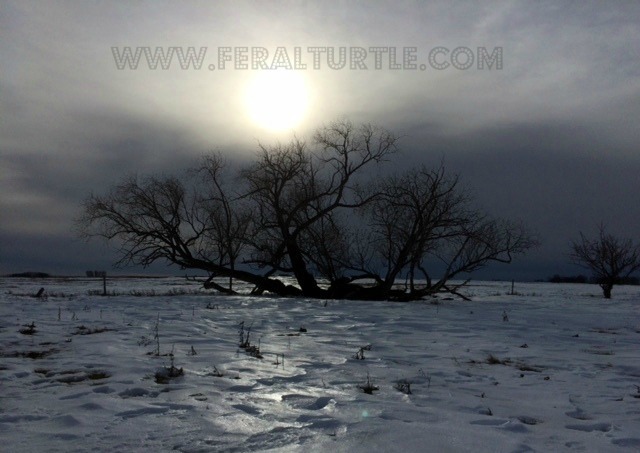 I'm so excited to see this as I know just where I can cut some red branches and make some ! I even have some homespun fabric I can use for bows! Glad Stephanie has the link party so we can follow great blogs like yours! Come on over for a visit! How clever and pretty! I love the hearts. Thanks for sharing it on your post! Hi Karen, Congrats on your feature at Stephanie's. Love these hearts!! Hugs for a great week my friend. I love hearts and love, and these hearts are just beautiful! I love it against that white door. So lovely. I don't know how I missed this post, Karen, because those hearts are so cute! Hi Karen, poppin in to say hi. Thanks for stopping over to visit. Have a nice weekend. I have been saving some branches just for this reason....you have inspired me to create something with them! Enjoy your weekend! Checking in to make sure you are still alive. Hoping all is well in your part of the world. I've missed you my funny friend! Love the rustic vintage feel of these hearts! A great idea.